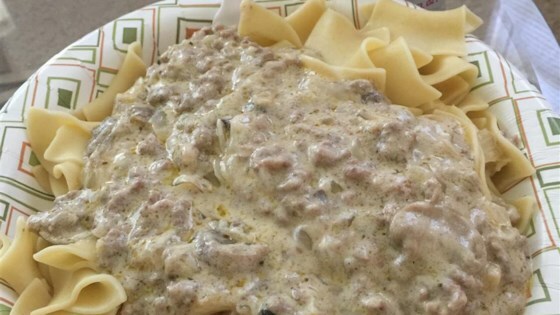 "Quick and easy hamburger stroganoff." Bring a large pot of lightly salted water to a boil. Cook egg noodles in the boiling water, stirring occasionally until cooked through but firm to the bite, about 5 minutes; drain. Melt butter in a large skillet over medium-high heat. Saute onion in hot butter until translucent, about 5 minutes. Add ground beef to skillet in small chunks; cook and stir to break the beef into smaller pieces as it cooks until no longer pink, 5 to 7 minutes. Sprinkle flour over the beef mixture, stir, and cook for 1 minute. Stir mushrooms and garlic salt into the beef mixture. Pour mushroom soup and chicken soup over beef, stir, and cook until hot, about 5 minutes; add sour cream, stir until smooth, and cook until again hot, 2 to 3 minutes more. Pour beef mixture over the cooked egg noodles. I'm 13 and don't really like to cook that much. This was super easy and kind of fun. Something for thought, I added Tuscan bread on the side. I will DEFINITELY make this again.